Another recipe featuring lots of coconut goodness and nourishing golden butter. almonds (soaked and dehydrated) however I also like to make them with macadamia nuts which are nutritionally better than almonds. You can make them using only coconut and in terms of nutrition this would be better than including any nuts. All nuts and seeds contain phytic acid (the same anti-nutrient found in grains and legumes that inhibit minerial absorption) and other anti-nutrients. Soaking them with sea salt helps to improve their digestibility however they still ain't that great for you. However nutrition aside, a few in moderation properly prepared, add a nice crunch to these balls. approx. 200 grams organic coconut - I like to use coconut flakes and make it finer in the mixer as I find it is a little fresher and meatier than desiccated. Mix all the ingredients together - I find pureeing each of the different components one at a time is best and then combining all in a bowl. Roll the balls in coconut and keep in a jar in the fridge. My Meal planner based on traditional foods is in progress. We are having my nonna's delicious meat balls for dinner.....without the pasta! Will be sharing the recipe soon. 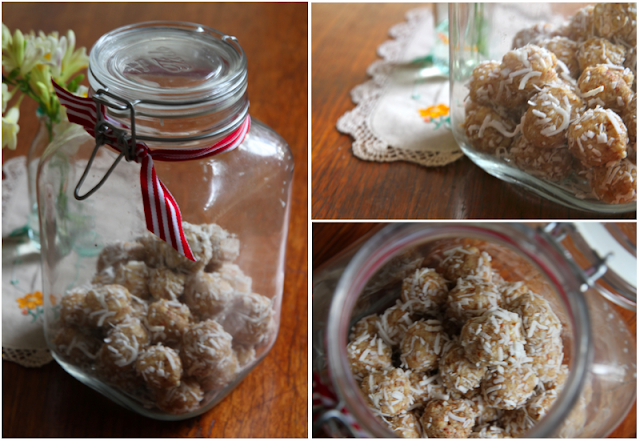 the coconut and butter balls sound delicious, will try them soon. thanks for sharing. Thanks Jo - love to know what you think!